It’s so easy to get wrapped up in the work. It’s so easy to forget the forest for all the trees all around you. It’s so easy to get lost in the day-to-day sharknado that pops up right in front of you and forget about the big picture. Is it a human shortcoming? As a writer, it’s so easy for me to be blinded to my goals on a big scale when things are going wrong in the now. I’ve struggled for the last two weeks, writing and re-writing a handful of scenes in my novel, becoming more and more myopic and less and less able to think on the large scale. I felt as though this one scene was a wrecking ball smashing the novel as a whole to rubble, that this one hangup was one crashed biker causing a monumental pileup as all the other bikers come scorching around the curve. Feet stuck in a quagmire. The whole house on fire. But the quagmire is not so much a bottomless pit of quicksand as a little mudhole. The house isn’t on fire, it’s just the spaghetti I was overcooking. (How I managed to set spaghetti on fire in this metaphor is hardly the point.) We’re talking about a mammoth manuscript of almost a hundred thousand words, and I was allowing myself to think the whole thing was scrap metal over a troublesome patch of three thousand. But one dubious passage can no more derail the work than an untied shoelace can stop a marathon runner. Sure, it’s annoying. Sure, it must be dealt with before it’s allowed to do further damage. But it’s fixable. It’s recoverable. All that’s needed is to step back and remember what’s at stake and what’s positive about the rest of the work. But it’s not just true as a writer. I feel this myopia as a runner. I’ve been dealing with injuries a lot lately, and it’s so, so easy to get tunnel vision over the injuries and imagine that my routine and my ability as a runner has been and will continue to be stymied by these injuries. And, sure, I’ve had a loss of fitness and definitely a loss of confidence over the setbacks. But even after taking a month off to get my feet right, I’ve been able to bounce back and start pushing my distance up again pretty quickly. It would be easy to focus on the negative, and that’s what I’ve done in recent weeks: that I’m not able to go out as fast as before or nearly as far as before. But I take a step back and it quickly becomes apparent that despite the setback, I’m bouncing back quicker than I really had any hope of doing while I was laid up. And, no surprise, I feel it as a dad. I get overwhelmed by the sprouts, and I feel like all I’m doing is putting out fires and telling them “no” and telling them what they shouldn’t do. Before you know it, I’m in a funk because I’m exhausted from all the screaming and reprimanding and the cleaning and the slaving. But a little step back — a little shift in perspective — reminds me that they’re growing up pretty good. They love to laugh and to show off what they know. They’re both incredibly smart. And, my shortcomings as a parent notwithstanding, they seem to be fairly well-adjusted. They’re gonna be fine. I’m a bit of a literature and film geek, and The Hobbit is somewhat front-of-mind at the moment. There’s a salient moment toward the middle of the text where Bilbo and the dwarves are lost in an evil forest; have been for weeks, doggedly following a path, not knowing how long it is or where it leads or even if they’ve made a wrong turn and are losing all their progress. Their eyes are down and it’s darkness all around them. They’re frustrated. They’re snippy. They’re turning on each other, ready to call the whole adventure off and go home. 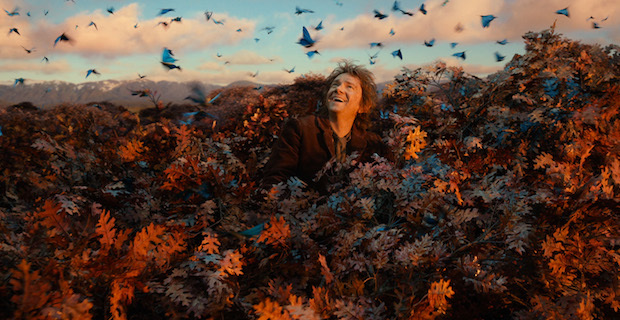 Then they have the bright idea for Bilbo to climb a tree and get some perspective on where they really stand. So he does, and his head breaks through the impenetrable canopy — the film captures this moment really beautifully — and he sees daylight for the first time in weeks. Feels the sun on his face again. Breathes clean air again. And from his new vantage point, he can see, in the not-so-distant distance, the looming peak of the Lonely Mountain, their ultimate goal, which they’ve made surprising progress toward despite their squabbling and doubt. Of course, when he descends, he finds that his comrades have been captured by and are about to become dinner for a gaggle of giant talking spiders, but I think it’s safe to say that’s beside the point. Much gets said, in this country and, heck, on this blarg, about the intrinsic value of sticktoitiveness. The usefulness, the inevitable necessity of keeping your head down and getting the work done. And there is value in that. A lot of value, even. Because if we have our heads in the clouds too often, if we spend too much time dwelling on the lofty goals and the dreams, well, then… that’s time not spent getting the work done. But nose-to-the-grindstone can’t be the only posture we exercise. As in all things, balance is key. Point is, the easy road is to become so lost in what you’re doing that you forget about the big picture. And if you lose sight of the big picture, then giving up doesn’t seem like that big of a deal. But giving up is a big deal. It’s the biggest of deals. Because when you give up, you essentially set fire to all the time and all the effort that you put into getting as far as you got. And if there’s one thing we don’t get back in this life, it’s time. So whatever you’re working on — your novel, your schoolwork, your health, your parenting — remind yourself that, every now and then, it’s okay — necessary, even — to take that step back. Take that breath of fresh air. See and appreciate the forest despite all the freaking trees. The work is important, but it’s no good if you don’t know where the winds are blowing the boat. This entry was posted on Saturday, December 13th, 2014 at 11:22 PM	and tagged with bilbo baggins, inspiration, motivation, parenting, perspective, SoCS, stream of consciousness, the hobbit, Writing and posted in Dubious Advice, Kids, Ramble, Running, Writing. You can follow any responses to this entry through the RSS 2.0 feed. Yep. That’s right. And I will explain thoughts about my own writing soon, I promise! Looking forward to it. Thanks for the reblogs. It’s got its ridiculous moments (the river chase in the barrels earned an eyeroll that left my optic nerves cramping) but the scenes with the dragon are actually pretty excellent. My novel? 233K+, and I still have six and a half scenes to write…there’s a LOT that will want fixing later, but there’s also a very vivid and complex story lurking in there, waiting to be teased out. I stopped running and doing many physical things a few years ago, when I seriously injured one of my knees – they’ve been arthritic since I was 11. Only in the last few months have I really felt confident to get back to doing those things, and it will be a long road….but I like the progress I feel. I get more done when I do things playfully. I laugh a lot, I indulge myself and others. I set timers and clean the house in sprints. I come to parenting and writing and my marriage with passion and playfulness. My kids say I’m a weird mom, and I always reply that that’s pretty lucky for them, because they could have a normal mom. I’m committed to living life as joyfully as I can manage. For me that means giving myself wholly to my life, and seeing the wide-angle as a matter of course.In 2012 I started participating in the A Round of Words in 80 Days writing challenge. I set my own goals, and I can change them as I see fit, and I alone determine whether I am succeeding. The nature of the schedule, four 80 days segments with breaks between, encourages that step back. Not only did you write a meaningful post here, Pav, but I think you may also have inspired my next ROW80 sponsor post – so thanks for that! You have the dubious distinction of writing comments almost as long as my blog posts, which is no small feat. Glad I could provide some inspiration. And yea though I walk through the valley of giant spiders, I shall fear no webs, for I wear really big shoes. If brevity truly is the soul of wit, methinks we’re both in trouble! My daughter loves the idea of venomous spiders. She’s been known to leave her rubber black widow (doesn’t EVERY little girl have one of those?!) in the hallway to terrify her big brother, who flees very swiftly and loudly in his big shoes!